These simple words, carved into a stone memorial outside the ancient church at Angouville-au-Plain, a small hamlet six miles south-west of Utah Beach in Normandy, recall the heroic actions that took place. In the early hours of 6 June 1944 two medics from the 101st Airborne – Kenneth Moore and Robert Wright – arrived to find themselves in the middle of a confused and savage firefight. Undeterred by the fighting around them the two men immediately set up a field dressing-station in the little village church to treat the growing numbers of wounded. In an act of true humanity within the brutality of war, the two medics insisted on treating every wounded soldier brought here equally, regardless of the uniform they wore. There was, however, one simple rule. No guns were to be brought inside the church. When two German paratroopers burst through the doors, machine-guns raised, the medics simply stared them straight in the eye and nodded down to the young German soldier they were treating. The two enemy paratroopers immediately understood. Both saluted and withdrew. By the time the fighting was over, all but three of the 80 wounded had survived. Simon Smith has brought this moving and act of heroism to life in his new edition. Every print is signed by ‘Art’ Petersen, a veteran of the fire-fight at Angouville. The Collector’s Edition is, however, even more special: additionally signed by D-Day 101st airborne medic ‘Doc’ Blaney, each print is also personally signed by KENNETH MOORE, creating one of the most moving and historic editions. This is a truly unique and memorable edition that will surely inspire enthusiasts and military art collectors alike, an piece to be treasured as a reminder of one of the most inspirational stories to come out of D-Day and the battle for Normandy. Private 1st Class ARTHUR ‘ART’ PETERSEN Serving with Fox Company, 506th PIR, 101st Airborne he was one of many paratroopers misdropped on D-Day. Landing near Sainte Mère-Église he briefly fought alongside Easy Company before heading south into the bitter fire-fight raging around the church at Angoville-au-Plain. After being wounded he was briefly treated in the Church and then fought in the advance into Carentan. He later jumped on Operation Market Garden, where he was wounded, but was back in action in time to re-join his unit in the Battle of the Bulge. Wounded yet again, Bastogne proved to be his final combat. Corporal T-5 KENNETH J. MOORE Joining the 501st Parachute Infantry Regiment, 101st Airborne Division in 1942, he trained as a medic and jumped into Normandy with the 501st in the early hours of D-Day, 6 June 1944. 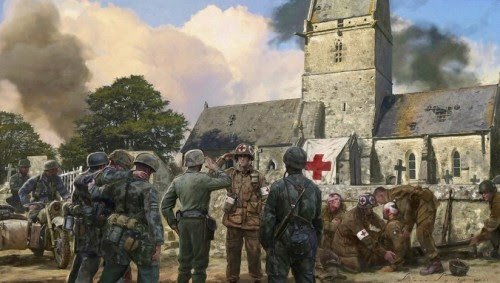 Together with 101st medic Robert E. Wright he found himself embroiled in the fighting around the hamlet of Angoville-au-Plain behind Utah Beach and the two medics immediately set up the field dressing station in the ancient church. After Angoville was secured he advanced with the 101st into Carentan and through Normandy, jumping on Operation Market Garden in September 1944, before seeing action again at the bitter siege of Bastogne during the Battle of the Bulge. By the end of hostilities he had received the Silver Star, Bronze Star and Purple Heart. Staff Sergeant ALLISON ‘DOC’ BLANEY Jumping on D-Day with the 326th Airborne Medical Company, 101st Airborne, he landed three miles from his designated Drop Zone. He immediately found himself in the middle of intense fighting and quickly set to work setting up a forward aid station. He served with the 101st throughout the advance into Normandy, jumping on Operation Market Garden and was at Bastogne during the Battle of the Bulge. Continuing to serve as a medic he stayed with the 101st all the way to Berchtesgaden at the end of the war.